Airtel/Docomo/Reliance users type sms as : FOLLOW CTRBADI send to 53OOO & FOLLOW GK4US send to 53000. 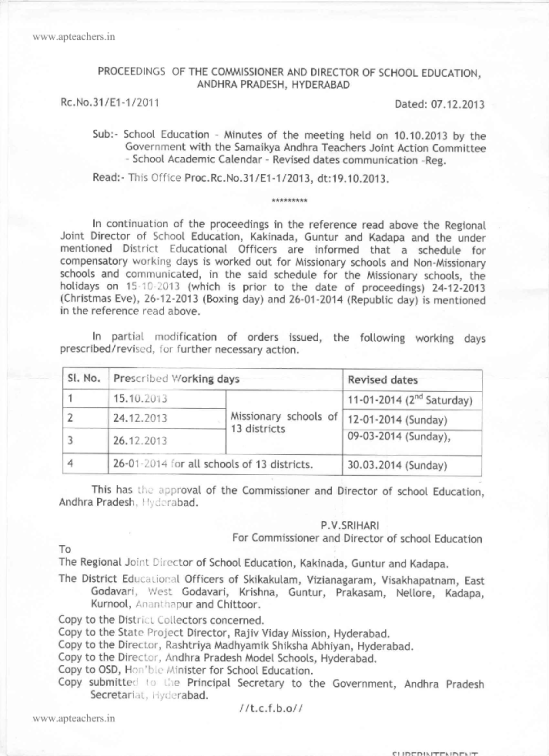 Rc.31/E1-1/2011 Dated 7th Dec 2013- The Compensatory Working Day falling on 26th Jan 2013 in 13 Seemandhra Districts is changed to 30th March (Instead of 26th Jan) due to the Republic Day. As per Rc.31 Dated 19th Oct it was decided and the Compensatory Holidays for Samaikhyandra Strike Period was released. But as the 26th Jan is Republic Day, it is now decided that the compensatory Working Day falling on 26th Jan is changed to 30th Mar 2014.